We offer programs for adults and kids (ages 4+). Cynthia Given is our staff massage therapist. She is licensed, certified, and insured. To schedule online, visit http://olneymassage.com. 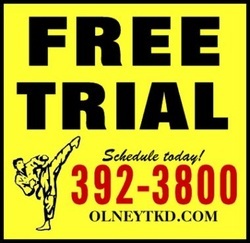 Olney Taekwondo Center and Princeton Martial Arts, members of the Kyumson Taekwondo Alliance (KTA), strive to provide quality martial arts instruction by blending traditional values with modern training techniques. All our instructors have met the KTA’s stringent instructor certification requirements and teach a standardized curriculum.